We are the operator of several producing fields offshore Brazil. They include the Bijupirá and Salema fields (Shell interest 80%) and the BC-10 field (Shell interest 50%). We also operate one offshore exploration block in the Santos basin, BMS-54 (Shell interest 80%). We have interests in two offshore exploration blocks in the Espirito Santo basins, BMES-23 and BMES-27, with interests of 20% and 17.5% respectively. 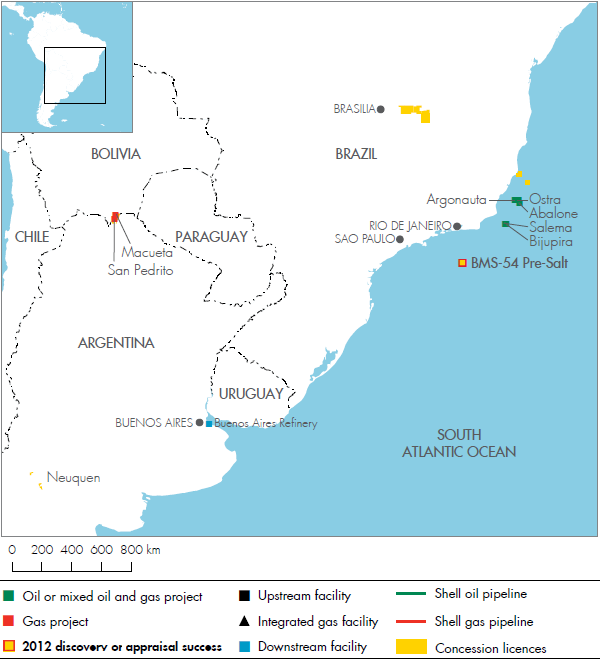 Shell also operates five blocks in the São Francisco onshore basin area. In 2012, we divested our 40% interest in the offshore Block BS-4 in the Santos basin. We also hold an 18% interest in Brazil Companhia de Gas de São Paulo (Comgás), a natural gas distribution company in the state of São Paulo.